MOSCOW, June 23. /TASS/. Frigates Admiral Essen and Admiral Grigorovich and Krasnodar submarine have destroyed by Kalibr cruise missiles large depots of armaments and ammunition of the Islamic State terrorists in Syria, Russia’s Defense Ministry said on Friday. 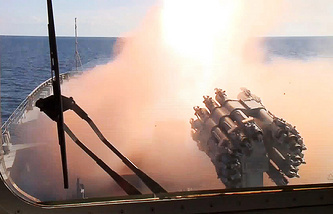 "The launches of six Kalibr cruise missiles were carried out from the eastern part of water area of the Mediterranean Sea by frigates Admiral Essen, Admiral Grigorovich and Krasnodar submarine of Russia’s Navy on the targets of the IS terrorist group in Syria," the statement said. The surprise massive missile strike destroyed command posts and large depots of armaments and ammunition of the IS terrorists near the Akerbat town in the Hama province, where an arsenal of gunmen was blown up after being hit by the Kalibr cruise missile, the ministry said. The ministry stressed that Russia's advanced diesel-electric Krasnodar submarine carried out launches of cruise missiles while submerged. "The remaining gunmen and targets of the IS terrorists were destroyed by airstrikes of bombers of Russia’s Aerospace Forces," it said. Russia informed the commands of Turkey and Israel timely about the launches of cruise missiles via channels of communication. The Islamic State terrorist group is deploying militants to Syria’s Hama where they equip command posts and also depots of armaments and ammunition, Russia’s Defense Ministry said. "Taking advantage of the dark time and a difficult ground relief, the terrorists deploy gunmen via various routes to the Hama province, where later they equip command posts and also depots of armaments and ammunition in large buildings," the ministry said. The ministry also noted that the command of Russia’s force grouping in Syria has launched a round-the-clock monitoring with the use of all kinds of intelligence on the routes of exit and dispersal areas of the IS terrorists. The detected terrorist targets are destroyed by high-precision weapons systems and aircraft of Russia’s Aerospace Forces. Over the past week, the IS terrorists have continued attempts to leave Raqqa and head to Palmyra via the "southern corridor," it said.